This kit is designed for use on 2004 and newer Evinrude® E-TEC® outboards. For safety reasons, this part should be installed by an authorized Evinrude®/Johnson® dealer. This instruction sheet is not a substitute for work experience. Additional helpful information may be found in other service literature for your engine. When replacement parts are required, use Evinrude/ Johnson Genuine Parts or parts with equivalent characteristics, including type, strength and material. Using substandard parts could result in injury or product malfunction. 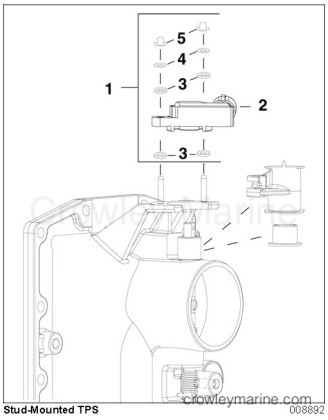 The replacement throttle position sensor (TPS) must be correctly aligned on the throttle lever bushing. Carefully follow these instructions to ensure correct procedure. 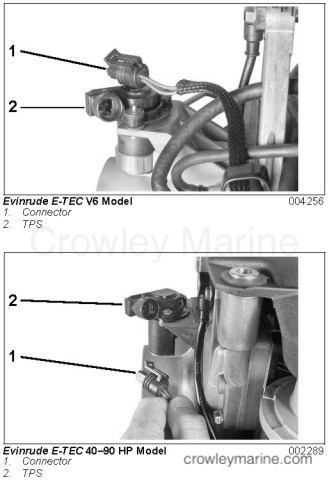 IMPORTANT: Refer to the appropriate Evinrude E-TEC Service Manual before attempting any service repairs or part replacement. Disconnect battery cables at the battery. Remove lower engine cover screws, including one at inside, top rear, and remove lower engine covers. Remove the electrical connector from the TPS. Screw Mounted — For screw-mounted sensors, reuse the existing screws and washers. DO NOT use additional fastener components included in kit. Stud Mounted — For stud-mounted sensors, use the fastener components provided in kit. IMPORTANT: Do NOT lubricate the throttle lever bushing to throttle shaft surface. 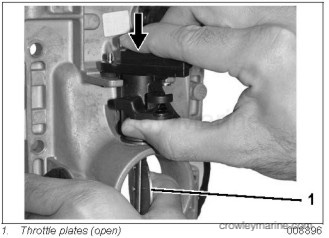 Some 2006 model year 40 – 90 HP outboards have washers under the throttle arm studs. If the washers are present, DO NOT use washers supplied in kit. 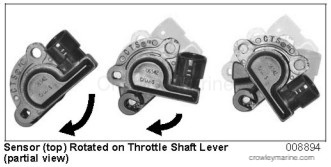 Rotate sensor on throttle shaft lever. This will allow the sensor and throttle shaft lever to align sensor mounting bracket holes over studs (or screw holes). There will be tension on the sensor, as it turns on the throttle shaft lever. The new sensor must be aligned on studs (or on screw holes) with the throttle shaft lever on the throttle lever bushing. 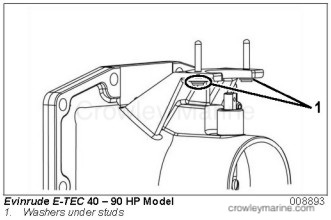 Correct alignment — Throttle plates MUST be opened so throttle shaft lever seats. 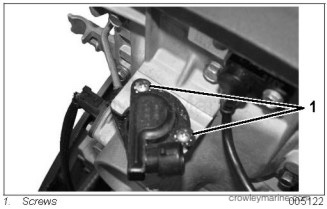 IMPORTANT: The sensor and throttle shaft lever WILL NOT seat if not aligned correctly. Correct alignment will allow for installation of push nuts (for stud mounted), or screws (for screw mounted). Screw Mounted — Do not use washers from the kit. Reuse the original mounting hardware. Adding washers will not allow screws to set. Install new TPS with screws. Stud Mounted — Install new TPS using washers and push nuts. 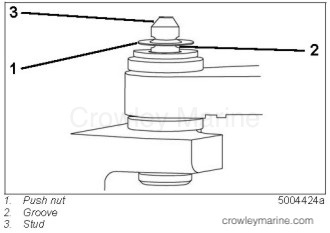 Do not press the push nut past the retaining groove in top of stud. Use Evinrude Diagnostics software to set TPS calibration. Refer to TPS Calibration in the appropriate service manual. 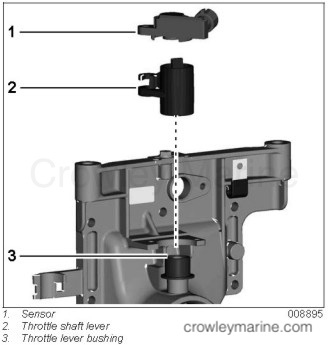 ICON Models: Use Evinrude Diagnostics software to calibrate throttle actuator stroke. 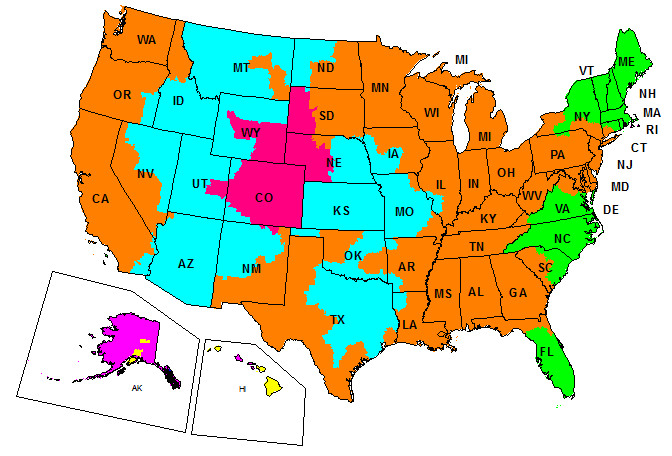 Refer to Calibrate Actuator Stroke in the appropriate service manual. Reinstall air silencer and lower and upper engine covers.